As I have said before, “blogging” and “competition” aren’t terms that go together very well. Through blogging you meet new people and begin sharing information or experiences with them. That tends to make one (well, me at least) LESS competitive, not more. So, I’ve recently decided to focus many of my competition posts on “spreading the word” about some awesome projects people here on blogosphere are involved in. I have no idea how many people read the posts – the only information I have is the number of comments. Spread the word and see what happens! That is my motto at the moment! I have already read Fiona’s incredible post on multitasking (yes, that’s the “m” word!) three times and still don’t feel I have taken it all in. There’s so much here to think about! For the moment I will start with one point. Somehow I always thought of multitasking in terms of amusing the baby and getting the dishes done at the same time, or cooking and thinking about Fiona’s blog post (which leads to forgetting the seasoning!). I hadn’t given much thought to how much (or how little) I’m having my students multitask in class. This sounds so true and so natural. It makes sense and worries me regarding my deaf and hard of hearing students. If you think of these children learning their l1 while interacting with their parents in real life situation, you discover that their vocabulary looks like a slice of cheese full of holes. There is no accidental learning – what was not taught isn’t known. So you find the 10 year old who doesn’t know the word “frying pan” as his mother says “I’ll make you an egg” not “I’ll make you an egg in the frying pan”. Or the 18 year old who had never encountered the word “ashtray”. I teach these children a foreign language through reading and writing. Form is our access to the language itself, “form” as in the written word. 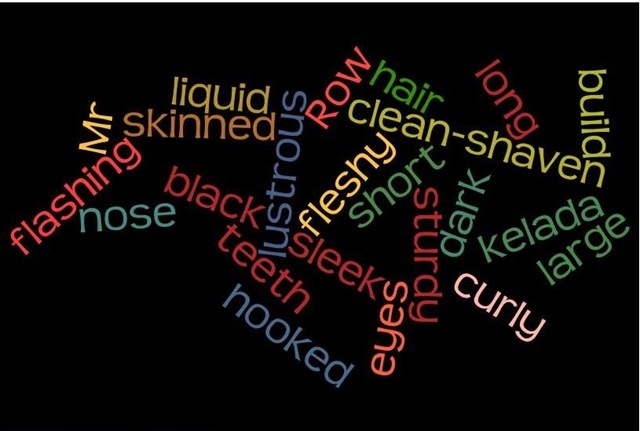 It is only when we work on vocabulary in an isolated manner, without a context, focusing on the shape of the word in order to remember its meaning, do the students exhibit word retention. So, you might say, for deaf and hard of hearing children learning words without context is more beneficial, and that’s that. Unfortunately, it seems to be so only for some of the children. Some seem to really internalize only those words that made a click in their brain somehow. I’m sure my student this morning will remember the word “cheap” because she hit on the idea that it reminds her of the word “chips” (French Fries) and they are cheaper than a hamburger. But that only works for her personally. And if each and every word she learns needs to have this “click” (and she’s in high-school!) before she can remember it, then she will join the ranks of those students who progress VERY slowly. Therefore, it seems that form and meaning are best taught together, as Fiona says, but that it is a very hard goal to achieve when language is acquired through reading and not listening! *** There are exception, of course! What a delightful travel book! I discovered this at the library. Australia has long been a source of fascination and one of the places all four of us dream of visiting. The book is old (written before 2000) but that’ s not really an issue. Bryson writes so beautifully and humourously that is ab absolute pleasure to read. I treat the historical parts as “true” and the parts supposedly described as “now” as a tale of his personal experiences, not necessarily the way thing are in Australia today. It seems he has written two more books – I’ll have to look them up! A Homage to The 30 Goals Project – Promoting it to Newbies! I just realized that a new 30 goals project had begun. Here I am participating in a blogathon competition with many new teachers who have never heard of the amazing Shelly Terrell and the project! Gasp! Particpating has had a TREMENDOUS impact on me. Not only was reflecting on the goals themselves beneficial, through the project I learned about blogging, tweeting and building a PLN! I decided my good deed for this competition would be to spread the word! So here is my post! Another Post for the Competition! I’ve posted a two part post (I have a 250 word limit there!) about homework. I have written about this topic often here so you will find the content familiar. The posts themselves are not copies of posts from this blog. Feel free not to click if you’ve been listening to me as things developed! It’s Saturday! Musings on Giving Books Away. I take a book out of the library. I really enjoy reading it and then what do I do? I return the book. I don’t think about it twice. You read, enjoy (or not) and move on. Why isn’t it the same for books we have purchased? Why do we feel the need to keep them? Why not give them away when we’re done to the nearest book lover? It makes sense to keep resource books – one needs to refer to them and reread them. It makes sense to keep children’s books. Children like to hear the same stories over and over again. Hopefully I’ll have grandchildren one day to read the books my boys liked when they were small (though I keep giving them to my little nieces and nephews so they might not survive till then!). It makes sense to keep a book that was a gift from a very special person. Or a book that touched you so deeply you know you must read it again. I’m very indecisive on the topic. I’m always trying to talk to people about books and then lending books to them. Sometimes I don’t get the books back. Sometimes I just give them away. Part of me is proud that I’m not flooding the house with books. I grew up in a house like that! Too many books! But then another part of me remembers the book and wonders why it isn’t on my shelves. I’m pleased when people return books but often (even within a week!) I’ve lent them out again! Mind you, we have three large bookcases of books in the living room (and each boy has one in his room!). But that’s it! 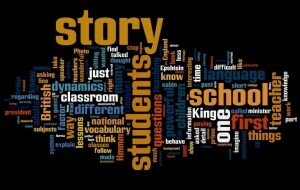 Showcasing Students’ Word Clouds – Advice Please! 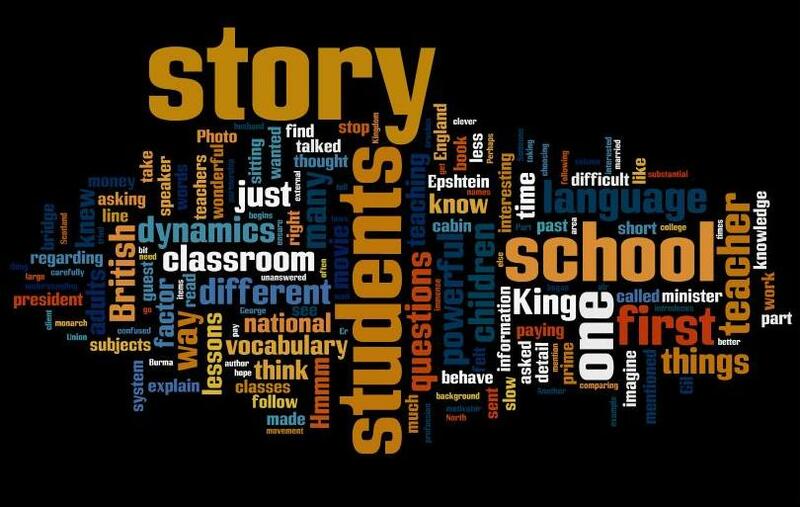 I’ve asked the students who are studying the story Mr. Know-All (by Somerset Maugham) to a make a word cloud of the sentences describing Max Kelada’s appearance. 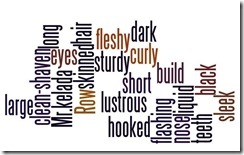 I’m still looking for the best and easiest way to showcase the word clouds. At first I made a page for them on our class site. There are four clouds there. The one that looks small and odd is the one I added the easy way – embedding the code. I tried resizing it but it doesn’t “behave”. The other three I copied with Jing, pasted into paintbrush, saved as a picture (in Jpeg) and then uploaded them to the page. That’s actually less work than it sounds as it goes fairly quickly. On the other hand I still have many word clouds to upload! Without solving THAT problem I decided to move the clouds to simple booklet. They take too much space on the wiki page and I want them to be large. On this site each student will get a page. However, I have the same problem. If I embed code, on this site it won’t resize at all! If I repeat the process described above it looks very nice. This is my latest post on the competition blog. 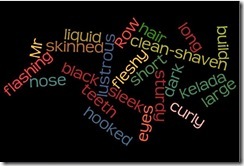 I would have given more examples and added a picture but I’m limited to 250 words and they don’t seem to do pictures!!! For what it is, here it is! Part Two of Competition Post: Yes Teacher! Google and I did my Homework! Part two is now up! I’m still feeling strange about posting “away from home”. I’m also not used to limiting my post to 250 words. That’s a very odd thing for me to say. I’m REALLY not a competitive person. The competition is a blogathon. And blogging is all about collaboration, not competition! I can get really excited about what other people have posted without feeling less proud of my own post! Despite all of that, first prize at this blogathon is HUGE – an all expenses paid trip to IATEFL in Glasgow! So I DID enter the competition! The number of participants in this blogathon is also HUGE, so I have decided to focus on making a splash. Since I cannot keep up with “double blogging” (don’t forget my Hebrew blog too!) for the next few weeks I will be letting you all know what I have posted on the competition’s blog. You can comment there – the judges also look at comments! So here’s the first post. A familiar topic but most certainly not one you have read before! Yes, teacher! Google and I did my homework!